Freshman forward Mezie Offurum makes a shot during a game against Valparaiso in December. When: Saturday, Jan. 11 at 4 p.m.
Men’s basketball (5–10, 1–1 A-10) rounds out a two-game homestand when it takes on Richmond (6–9, 0–2 A-10) Saturday afternoon. GW is coming off a crushing loss to Dayton, where the Colonials led by as many as 22 points in the first half but ultimately fell 72–66. The Spiders are off to a slow start in Atlantic 10 play, dropping both of their contests to Dayton and Rhode Island. Last season, the Colonials and Spiders faced off twice with opposite outcomes. 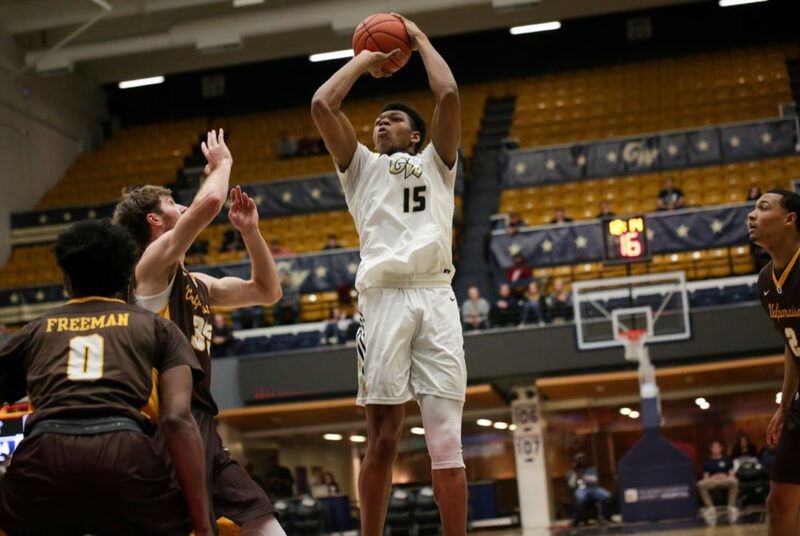 Richmond claimed a 78–68 victory on its home court last January, but GW came away with one of its biggest victories last season in a 103–77 decision in February. The Colonials suffered a harsh blow after allowing their lead to evaporate against Dayton, but their dominant first-half showing proves their ability to contend in the A-10. GW’s leading scorer, redshirt junior guard DJ Williams, regained his stride in the last game and dropped 20 points after struggling offensively against Saint Joseph’s. Williams – who has been one of the most accurate shooters for the Colonials this season – will be crucial in gearing up GW’s offense Saturday. Although dismal second-half shooting diminished GW’s field goal percentage against the Flyers to 37.5 percent on the night, the Colonials shot 15-for-30 in the first half – good for a 50.0 percent clip. If the Colonials can replicate their first half performance against a Richmond squad that has allowed its opponents to shoot at a 48.5 percent rate this season, they will be primed to control the contest. The boards have been a point of weakness in many matchups this year for the Colonials, especially after losing junior forward Arnaldo Toro for the season with a hip injury. But against the Spiders, rebounding may be less of a problem. Richmond averages only 30.0 rebounds per game while the Colonials sit at 33.8 per game, and no Spider averages double-digit rebounds per game. Richmond hasn’t fared well away from home, dropping four of its six contests on the road or at neutral sites, but the Colonials are 4–5 at the Smith Center. GW should be able to capitalize on its home court advantage and will likely come out to a quick start like they did against Dayton. The Spiders have had the upper hand against the Colonials in the two seasons since head coach Maurice Joseph took over the program, going 4-for-1 against GW during this span. Richmond redshirt sophomore forward Grant Golden’s 17.6 points per game are good for fourth in the conference. In their past two matchups, the Colonials have allowed Saint Joseph’s redshirt sophomore to score 20 points and Dayton sophomore Jordan Davis to drop 25 points, so Golden will likely be able to replicate the success of these sharpshooters and cause problems for GW. GW was sloppy with the ball against Dayton, and Richmond averages 14.5 points per game off turnovers. The Spiders will likely try to exploit this weakness again on Saturday to gain some fast points. Richmond is averaging 7.8 steals per game this season, while only allowing its opponents 5.7 steals per game. With a 46.9 percent accuracy rate from the field, Richmond has been the second-best shooting team in the A-10 this season behind Dayton. They have also been one of the strongest three-point shooting teams in the league at 33.8 percent on the year. GW’s perimeter defense has been lacking all year, and if the Spiders can heat up from beyond the arc, they may be able to run up the scoreboard. With both teams coming off losses, both squads will be hungry to bounce back. After beating Saint Joseph’s and showing up Dayton in the first half, the Colonials have shown the depth of their improvement since the beginning of the season and their ability to compete with A-10 competitors. But the Spiders are a strong shooting team, and GW has struggled to consistently contain teams on the perimeter. Richmond’s solid shooting performances so far this season indicate that they will likely best the Colonials from the field and have the advantage in the contest.